Electrical work on commercial and industrial installations often requires working on motorised machinery with three phase supplies. Correct sequence of the phases is important with certain motors and pumps as damage to brakes and valves will occur in minutes with incorrect phasing. 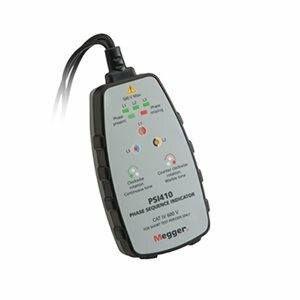 The Megger PSI410 phase rotation indicator provides rapid indication of correct phase sequence utilising a three bi-coloured LED display and a specific audible tone.